200 Free chicken feed sources, the ultimate list! Saving money while raising chickens is one of my favorite topics with feeding my chickens for free being my ultimate goal. (I know, talk about this a lot!) Of course cheap chicken feed ranks pretty high on my list of favorite things too! Everyone wants to feed chickens without buying commercial chicken feed, right? But what do chickens eat besides chicken feed? I went in search of every free and cheap chicken feed source I could find and I found a lot of common advice and several outside the box amazing ideas for feeding the chickens for free, or cheap! These were the methods that everybody had tried and had great success with. Of course I already use those ideas, so I was looking for new substitutes for chicken feed. My obsession with saving money on chicken feed has been going on for quite a while. Several years back I wrote a series of Feeding Chickens for Free posts. Free feed: restaurant produce. If you or someone you know works in a restaurant ask if you can have food they're going to throw away for your chickens instead. It worked for me and I scored garbage bags full of salad! Free feed: Weeds! Yes...really! In this post I discussed all the common garden weeds we tear out almost daily and why you should feed them to your chickens instead. Free feed, garden rejects. Not everything that grows in the garden is fit for human consumption. I feed everything that's critter damaged or otherwise unappetizing to us, to the chickens instead and they love it! Pumpkins for free feed. This post starts by discussing how I give my chickens the insides of our pumpkins when I carve them for Halloween. I also explain how pumpkins that are bought just for decorations can be fed to the chickens after the season is over. As you can see low cost chicken feed is sort of an obsession with me. When you're feeding lots of chickens though, it's important to cut costs wherever you can! Thankfully, others share my passion and I had no trouble finding lots of new ideas for saving money! Now let's get into what I found from all these amazing homestead bloggers. Click any of the titles to read the original article. MrAnimal Farm has 5 Simple ways to cut your feed cost in half and I never even thought of #4. I need one of those! Frugal Chicken can teach you how to Raise mealworms, red wrigglers and crickets to save money on your feed bill! For a really small investment, you can have a fresh protein source for your chickens all year long. Garden Betty Ferments grain to save money on chicken feed. She has a really easy to replicate fermenting system. You should try this! A Chick And Her Garden talks about Harvesting sunflower seeds for chicken feed. I love the idea that something so pretty is also a useful food source. Sunflower seeds can get expensive so this is a great money saver. Stone Axe Herbals has 12 Ways to feed chickens for free and you have GOT to see what they do with the bucket. Ewww, but it will work! Abundant Permaculture set up a what he calls The compost system on steroids and saved 100% on his feed bill. That's insane! I only managed to Save $450 on my feed bill. I'm seriously jealous here! Homegrown In The Valley has 5 Ways to feed chickens on a budget and one of them is a cool trick to get free cracked corn. 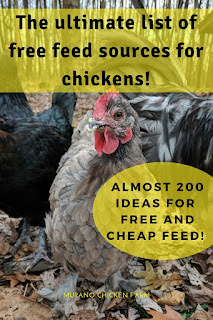 The Prairie Homestead has 15 Ways to save money on chicken feed and I've been meaning to try #10. I wonder where I could buy a starter? 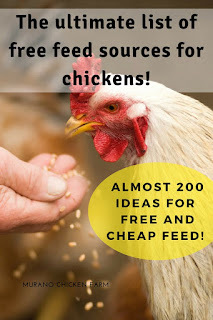 Reformation Acres has 36 Free chicken feed ideas. Whoa! 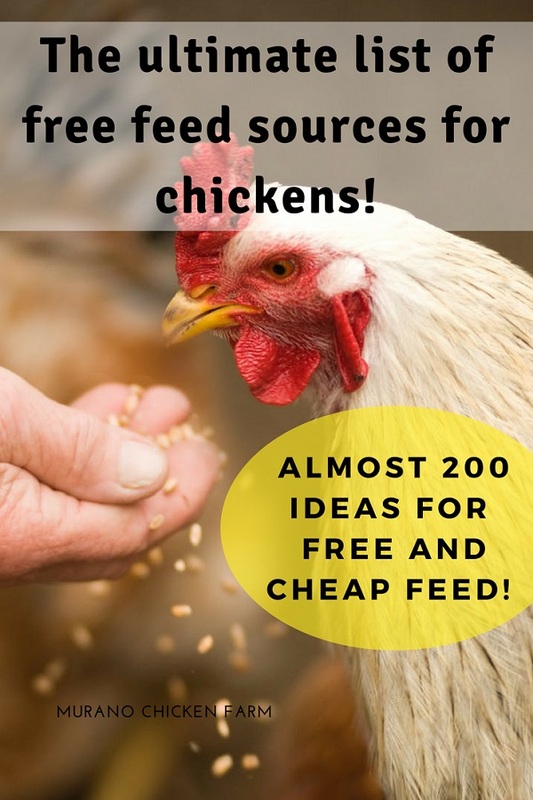 This is an amazing list of free and cheap chicken feed ideas. The Prepper Project has lots of ideas for Feeding chickens without buying feed and they do it on under an acre! Practical Permaculture has Eliminated the cost of chicken feed completely. The Homesteading Hippy has the Top 10 plants to grow for chicken feed and I had not even considered #8! Morning Chores has ideas for 26 Cheap chicken feed that won't break your wallet, yet still high in nutrients. #23 is a great idea for fall...that stuff normally just goes to waste! Souly Rested found a Free snack that her chickens love! Hillsborough Homesteading has quite a few tricks up her sleeve with 13 Creative ways to lower your chicken feed bill. Farming My Backyard Puts the compost bin in the chicken run. Backyard Chicken Project has 10 Ways to cut the feed bill and I'll bet #2 works every time. Oak Hill Homestead did a 4 week self reliance challenge and came up with 6+ Ways to save money on chicken feed. Many homesteaders like to plant a garden just for the chickens. These chicken feed gardens really help cut the cost of chicken feed, though they do require a small investment for seeds and some time to tend them. Others just like to feed the chickens out of their own gardens. They both work great for providing really low cost chicken feed and are an excellent source of feed if you're trying to feed your chickens without grain. Attainable Sustainable is Growing an organic chicken garden. This garden includes more than 19 different feed plants that the chickens eat including a tree that I always thought was ornamental...but the chickens love it! Reformstead has a list of 15 plants to grow that will lower your chicken feed bill. There are lots of grains and seeds on this list that I didn't even realise you could grow on a small scale. These would make excellent chicken feed! Reformation Acres grows 12 Perennials for free chicken food. I love this plant it once and harvest every year approach to feeding the chickens for free! That is a lot of ways to save money while raising chickens, don't ya think? I can't wait to try more of these ideas....I'd like to cut my feed costs in half again. Wish me luck!